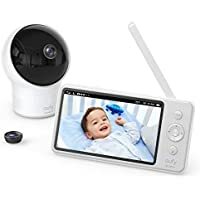 Get Eufy SpaceView Baby 5" LCD Security Monitor 720p HD, 460 Ft Range, Wide-Angle Lens Included, Night Vision, 2-Way Audio, 2900mAh Rechargeable Battery, Smart Alert for only $125.99. Tip: Avoid low or no feedback sellers, search and select "Buy It Now" tab and sort by lowest price. You may modify min price to filter accessories to get Eufy SpaceView auctions.